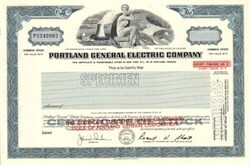 Beautifully engraved certificate from the Portland General Electric Company. This historic document was printed by Jeffries Banknote and has an ornate border around it with a vignette of lady sitting on a bench in front of the Trojan Nuclear Power Plant. This item has printed signatures by the Company's Chairman of the Board and Secretary. Portland General Electric is a recognized leader in the utility industry with more than a century of experience delivering safe and reliable electricity. PGE serves more than 755,000 retail customers in the Northwest. The Trojan Nuclear Plant is about 42 miles north of Portland in Columbia County on the bank of the Columbia River. Portland General Electric (PGE) permanently closed Trojan in 1993.